The great metropolis of London, a short description. London was founded as a communication center by the Romans shortly after they invaded Britain in 43 AD. The name of London probably come from the Celtic “Llyn Din” that means “Hill by the pool”, which the Romans turned into Londinium, as it was called then, was a little village on the Thames, on the route to the provincial capital in eastern England. The Romans built a bridge across Thames on that route, the first bridge on the Thames near the little village. London had narrow, congested streets lined with tiny shops and houses built of wood and plaster back then. Even the London Bridge, which was considerably more than just a river crossing, had this tendency of narrow, crowded spaces. Therefore, a new stone bridge was built in 1176 to replace the old one. The city of London grew, and so did its population; by 1600 there were 200.000 souls, by the end of the 17th century shot up to 575.000, surpassing Paris as the largest city in Europe. Thus, London became the biggest city in Europe. 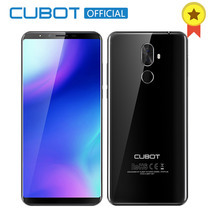 It also became a cultural center, the center of the English cultural Renaissance, with major figures as Christopher Marlowe, Ben Jonson, William Shakespeare. London was Britain’s economic powerhouse and the center of a burgeoning empire. The city continued to grow and develop to what we see today, always combining the past with the present. In fact, that’s what I think of when I think of London: a perfect binding of the past and the present. I think of the Big Ben, the Houses of parliament, Boadicea and Her Daughters facing Big Ben and the Palace of Westminster across the road, 10 Downing Street, the Tower Bridge, the Great Fire, Barbican Arts Center, parks, Nelson’s statue in Trafalgar square, the wax museum, Peter Pan in Kensington Gardens, Buckingham palace, the double deckers, the black cabs and, last but not the least, rain. 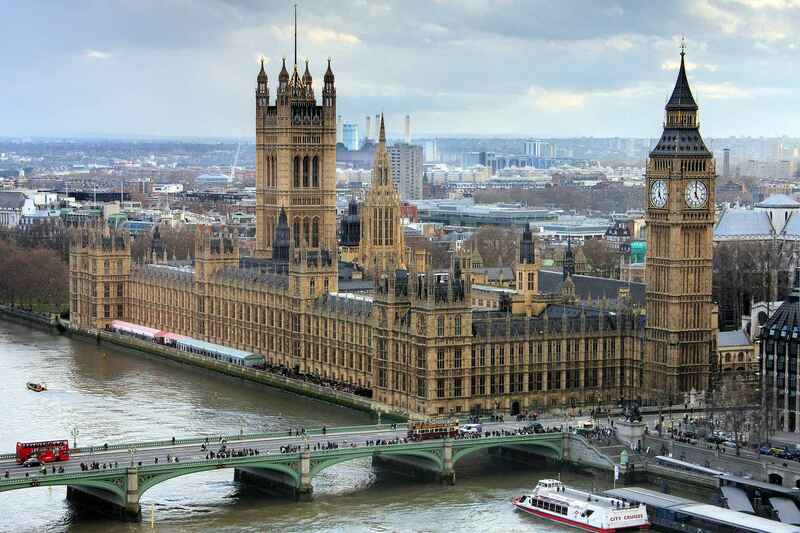 The Houses of Parliament, also called the Palace of Westminster, range along the Thames with Victoria Tower at one end and Big Ben, the famous bell in the Clock Tower, at the other. Westminster Abbey, built in Gothic style, has been the scene of the coronation of sovereigns from William the Conqueror to Elizabeth II. Buckingham Palace was made the official residence of the Sovereign by Queen Victoria. The Royal Guards change at 11.30 every day much to the delight of the tourists. Sir Christopher Wren’s baroque masterpiece known as St. Paul’s Cathedral was built after the Great Fire in 1066. The Duke of Wellington, Wren himself and Nelson are buried here. Lord Nelson’s statue dominates Trafalgar Square, a big square in the center of London named in commemoration of a great English naval victory. People and especially pigeons gather here to see the fountains, the big lions and the statue of the victorious Admiral. The National Gallery, situated on the north side of Trafalgar Square, houses one of the richest collection of paintings, most Renaissance and Impressionist works. Madame Tussaud’s exhibits wax models instead, models of famous historical characters, film and sports starts, Royalty statesmen. A more conventional museum is the British Museum, which shows the works of man from prehistoric times to the present day. There are permanent displays of antiquities from Egypt, Western Asia, Greece and Rome. It also includes one of the most famous libraries in the world. But there isn’t much excitement in the British Museum, for fun and entertainment one could always go to the Barbican Arts Center, a good example of modern architecture. And after the sunset, there are dozens of theatres just a few minutes walk from Piccadilly Circus (West End theatres), and so is the world famous Covent Garden, home of the Royal Opera. For those who like discos and nightclubs, they can find them near Leicester Square, open till late. A world in one city … The conclusion remains the same… London is a perfect binding of the past and the present, a city with so many places to visit that one couldn’t find the time to view them all, that’s why Samuel Johnson was right when he said that when someone is tired of London he is tired of life. What strikes visitors more than anything else about London is the sheer size of the place. 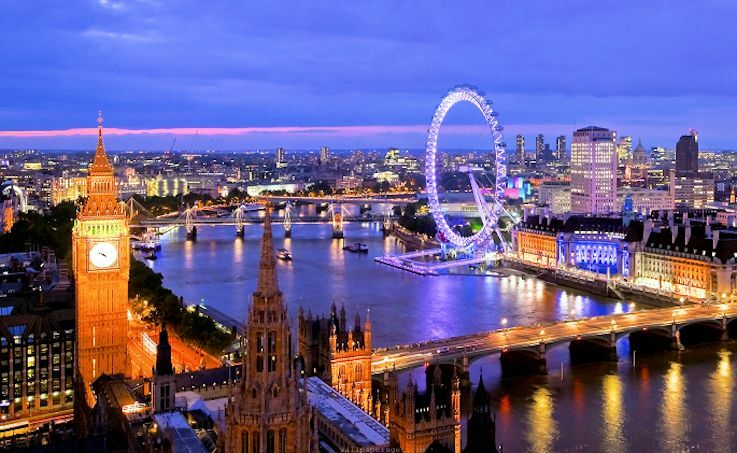 Stretching for more than 30 miles on either side of the Thames, and with an ethnically diverse population of nearly 8 million, it is Europe’s largest city. 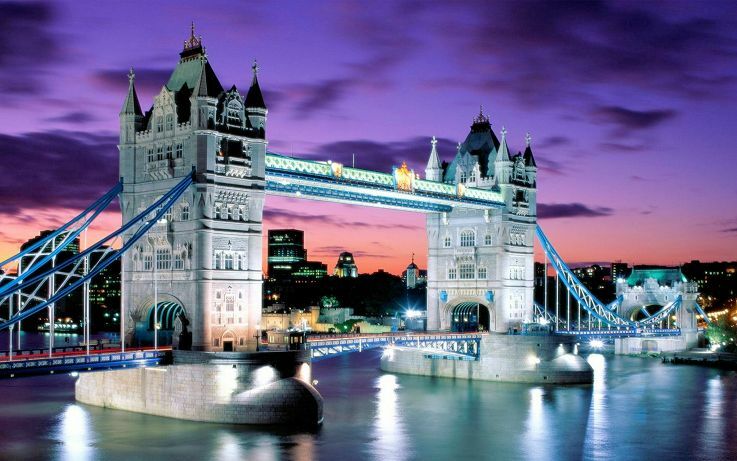 London’s traditional sights draw millions of visitors every year. From Victorian architecture to the great churches of Christopher Wren, monuments from the capital’s more glorious past can be seen at every turn. The capital’s quiet Georgian squares, riverside walks, and alleyways of the City of London are also there waiting to be discovered. London is also a surprisingly green city, with Hyde Park, St James’s Park and Green Park all within walking distance of the West End. London is an exciting place for the visitor. London’s world-class galleries, museums and institutions have almost all been reinvented in the last few years, from the Royal Opera House to the British Museum. With the completion of the Tate Modern and the London Eye, the city can now boast the world’s largest modern art gallery and observation wheel; as well as two new pedestrian bridges, including the first to cross the Thames for over a hundred years. London’s theatre land is in a league of its own, attracting the talents of Oscar-winning and top Hollywood actors. London knows how to put on a show and with some of the best performances on the planet, it will entertain your socks off! You could spend days just shopping in London. If you can’t buy it in London, you may well have trouble finding it anywhere. The difficulty is in knowing where to begin! From the department stores of Oxford Street, or more exclusive shops of Bond Street or Mayfair, to the markets of Portobello Road, Camden or Greenwich, you will be spoilt for choice! London is marked by its history. For almost all of it the key factor was the bridge(s) across the Thames. First built by the Romans, it made Londinium a trade centre, and a sea port. The bridges across the Thames remain major features. As London grew it absorbed previously separate villages, and even another city (Westminster). Some of these have simply vanished, others retain something of their character, or at least a name. Layer upon layer of history make London… Once a walled city, London wall is still a street name and there are Roman and younger traces still standing. London Wall was the defensive wall first built by the Romans around Londinium, their strategically important port town on the River Thames in what is now the United Kingdom, and subsequently maintained until the 18th century. It is now the name of a road in the City of London running along part of the course of the old wall between Wormwood Street and the Rotunda junction where St. Martin’s Le Grand meets Aldersgate Street. Until the later Middle Ages the wall defined the boundaries of the City of London. Then there was fire: The great fire of London changed its face, as did the Luftwaffe in Word War Two. Out of the ruins of each respectively came Wren’s churches and 1950’s civic development. More of the latter has since been demolished, but much of both can still be found. London, standing on soft clay not hard stone, was late to high rise buildings, but any modern description of London would include The Gherkin; (built on a site opened for development by an IRA bomb) and Canary Wharf, as well as The Houses of Parliament and St Paul’s cathedral. 30 St Mary Axe (widely known informally as The Gherkin and previously as the Swiss Re Building) is a commercial skyscraper in London’s primary financial district, the City of London. It was completed in December 2003 and opened in April 2004. With 41 storeys, it is 180 metres (591 ft) tall and stands on the former site of the Baltic Exchange, which was extensively damaged in 1992 by the explosion of a bomb placed by the Provisional IRA in St Mary Axe, the street from which the tower takes its name. The London Eye is a giant Ferris wheel on the South Bank of the River Thames in London. Also known as the Millennium Wheel, its official name was originally published as the British Airways London Eye, then the Merlin Entertainments London Eye, then the EDF Energy London Eye. Since mid-January 2015, it has been known in branding as the Coca-Cola London Eye, following an agreement signed in September 2014. The entire structure is 135 metres (443 ft) tall and the wheel has a diameter of 120 metres (394 ft). When erected in 1999 it was the world’s tallest Ferris wheel. Its height was surpassed by the 160 m (520 ft) Star of Nanchang in 2006, the 165 m (541 ft) Singapore Flyer in 2008, and the 167.6 m (550 ft) High Roller (Las Vegas) in 2014. Supported by an A-frame on one side only, unlike the taller Nanchang and Singapore wheels, the Eye is described by its operators as “the world’s tallest cantilevered observation wheel”. It is currently Europe’s tallest Ferris wheel, and offered the highest public viewing point in London until it was superseded by the 245-metre (804 ft) observation deck on the 72nd floor of The Shard, which opened to the public on 1 February 2013. It is the most popular paid tourist attraction in the United Kingdom with over 3.75 million visitors annually, and has made many appearances in popular culture. The London Eye adjoins the western end of Jubilee Gardens (previously the site of the former Dome of Discovery), on the South Bank of the River Thames between Westminster Bridge and Hungerford Bridge, in the London Borough of Lambeth.